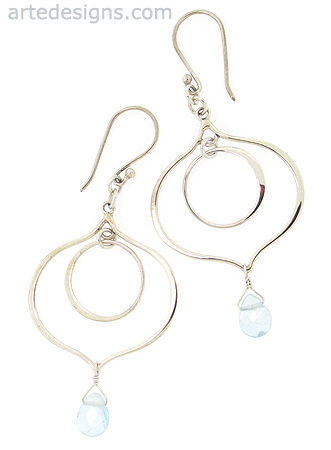 Faceted blue aquamarine gemstones sparkle as they dangle from unique handmade sterling silver hoops. Aquamarine is a very soothing and calming gemstone. It is believed to protect travelers, especially travelers on water. It is known to help reduce stress, overcome fears, and heighten intuition. Slightly over 2.50 inches long. Sterling silver wires.